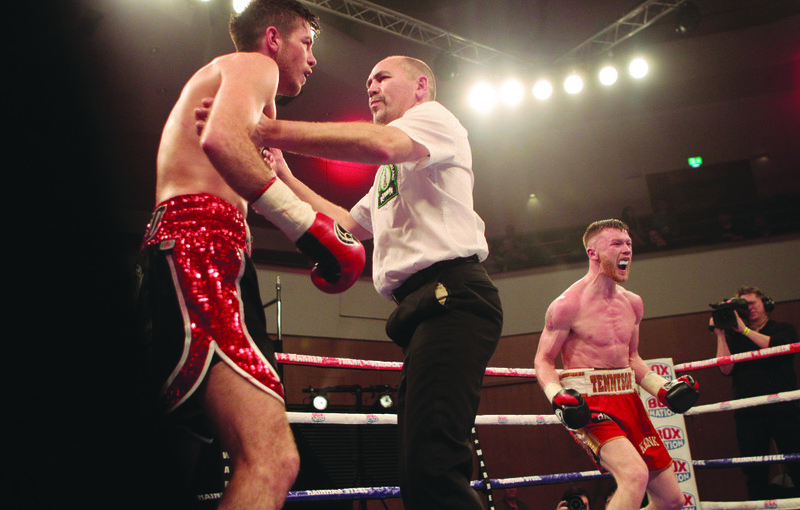 THE Irish super-featherweight title is back in the possession of James Tennyson once again following his sixth round victory over Declan Geraghty on Friday. Tennyson won the title back in 2013 but moved down to campaign at featherweight. Now back up at the 130lb limit, ‘The Assassin’ powered past Dublin’s Geraghty in a fight that lived up to expectations as a meeting of power puncher and slick boxer. Geraghty was on form from the off, catching Tennyson with counters out of his southpaw stance to take the opening round, but the momentum swung the other way in the second with a right hand dropping Geraghty who recovered well, but abandoned his boxing in favour of trading with Tennyson which suited the Poleglass man. This trend continued in the third with Tennyson happy to stand and have a fight with Geraghty who did land a solid left, but the West Belfast man seemed to get the better of the exchanges. The pendulum swung back in favour of Geraghty in the fourth and fifth as he got back to picking his shots better and countering well to leave things finely poised going into the second half of the fight. Geraghty again seemed to be banking the sixth with his boxing skills to the fore, but a right followed by a left hook dropped him heavily and while he did rise again, an onslaught of uppercuts forced David Irving to step in with seven seconds of the round remaining. “I knew I was in control and that he would tire out,” said Tennyson after. “He was dancing about on his toes too quick so I knew there was only so long that could go on and we would trade. “I felt the left hook landing and knew that was it. His shots didn’t faze me too much, I was comfortable in there. There had been sportsmanship shown before the fight and it was the same after with Geraghty making no excuses although he did feel the fight was stopped a little bit too quickly. “It was a hard fight. It was much closer than I thought it was going to be,” he admitted. “He had a bit of power but I thought the stoppage was a bit early, but I’m not going to dwell on it. “He won and I’m not going to argue with it. He is a lovely fella, I wish him all the best and hope he goes on to bigger and better things. For Tennyson, there are a number of options including a defence of the title, but he is targeting a return to British title level at his new weight having lost out to Ryan Walsh for the featherweight belt last year, but he is thrilled to get his hands back on his old belt for now. “It’s a great way to get it back so I’m over the moon,” he confirmed. “I felt the shot and I knew when I landed it, that was it over. I felt it in my knuckles so I think it was the right decision. I was landing lovely and hurting him. As soon as I was there I knew we were going to have to trade. “There are bigger and better things out there so we will see what the future holds. “I want to get back up there (in the British rankings) so I needed to get myself a good win. My last performance wasn’t that great, but I’m comfortable now.